We’re finishing up with the Distributed Open Collaborative Course on Women and Technology, and one of the last things I’ve done in this course is show visiting students how to build. I have to admit, it was a hoot, and I hope they had as good a time as I did. There are times when I wonder why I get paid for doing what I do. Students were working with ideas of labour and value, in connection with the excellent dialogue on Systems, one of my favorites from the course. They had been assigned the task of making something and assessing its exchange value. It seemed natural to bring them into Second Life and have them work there. 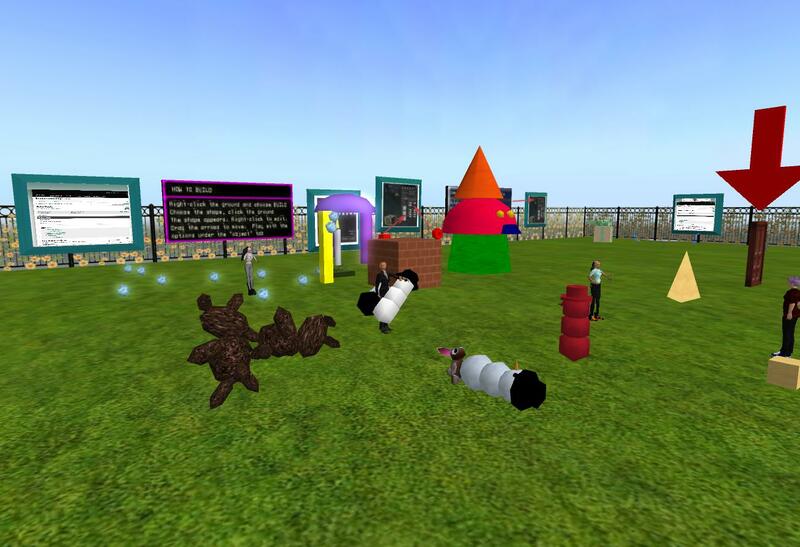 The students had done an orientation tour of Second Life, and had also participated in one of my Introduction to Women’s Studies classes, so they didn’t need to be shown how to orient themselves in the space. We did spend some time on finding the sandbox and getting students into the group that allowed them to build, but after that it was basically a case of me demonstrating something, and the students following along. Before long, we had an army of snowmen, a couple of dancing rabbits, and some very odd mushroom sculptures. When the students had had time to explore the possibilities of building, I introduced an idea with an object, a musical candle that I made some years ago as a Second Life “seasons greeting” card. When clicked, the candle speaks a greeting and plays a tune. 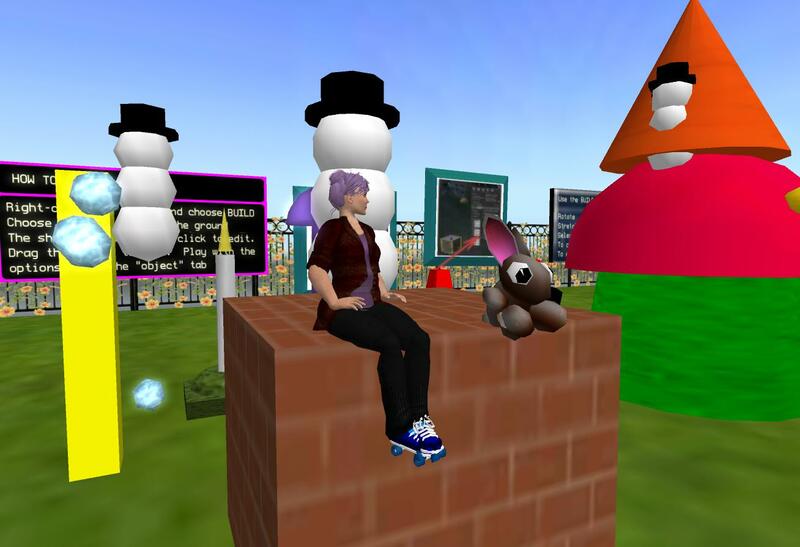 We had a fairly good discussion on the value of the candle within the economics of Second Life, while at the same time animating snowmen to send out jolly greetings. Working with the students made me think of one of my earlier blog posts on the potential of “doodling” in Second Life. There is something about playing with concrete representations while working out abstract problems that is immensely satisfying to many of us. Somehow, the “play” of making things can make the ideas much more intense. I also think that the objects created within a “doodling” lesson would be powerful memory tools. This experience has made me rethink the use of building in my classes. I used to have students finish the course with an “open house,” where they presented their powerpoint slides, and I encouraged them to decorate their presentations with appropriate objects. My favourite was a presentation on environmental racism, which was surrounded in smoke and oozed sludge and slime. However, with some really splendid exceptions, most of my class found the open house to be extra work at the end of an already crowded term, so I dropped it. Perhaps I gave up on building too soon. There are ways to connect building to class discussion in a way that is not demanding, and in a classroom situation it is less important if the student doesn’t get it right the first time. It would be a good way to assess student involvement during class discussion, and it would be less difficult for the student if building were picked up as incidental learning during short lessons over the whole term, rather than facing the more stressful task of making something for guests at the end of term. I’m going to give this a try.